Firefox Focus for Android and iOS is Mozilla’s privacy-centric mobile browser. Today, the organization stepped up this promise of keeping its users’ data private by adding to the browser a few new features that expand on this by adding a new privacy feature, as well as a few other new tools. The main new addition here is support for Enhanced Tracking Protection. This feature first launched in Firefox for the desktop. It allows you to block cookies and trackers with a bit more granularity than was previously possible. 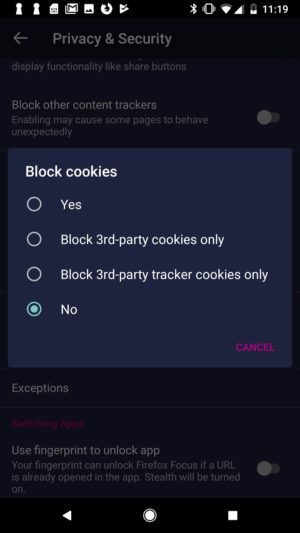 Until now, Focus blocked all cookies by default. Now, however, you can choose to either continue doing that — but with the risk of sites breaking every now and then — or opt to allow third-party cookies or only third-party tracking cookies. Mozilla uses Disconnect’s Tracking Protection list to power this feature. “This enables you to allow cookies if they contribute to the user experience for a website while still preventing trackers from being able to track you across multiple sites, offering you the same products over and over again and recording your online behavior,” Mozilla explains. Mozilla also today announced that Firefox Focus now checks all URLs against Google’s Safe Browsing service to ensure that users don’t click on known phishing links or open other fraudulent sites. While using a Google tool may seem a bit odd, given that Firefox and Chrome are competitors, it’s worth noting virtually every browser makes use of Safe Browsing (and that Mozilla pulls in a lot of revenue from its search engine deal with Google). In addition, iOS users who opt for Firefox Focus will now be able to get search suggestions, too, just like their friends on Android . There’s a privacy trade-off here, though, as everything you’re typing is sent directly to the likes of Google for offering you those suggestions. Because the focus of this browser is privacy, the feature is turned off by default, though. Soon after Google unveiled the top trends in what people searched for in 2018, Baidu published what captivated the Chinese in a parallel online universe, where most of the West’s mainstream tech services, including Google and Facebook, are inaccessible. China’s top search engine put together the report “based on trillions of trending queries” to present a “social collective memory” of internet users, said Baidu; 802 million people have come online in China as of August, and many of them use Baidu to look things up daily. World Cup: China shares its top search with the rest of the world. Despite China’s lackluster performance in the tournament, World Cup managed to capture a massive Chinese fan base who supported an array of foreign teams. People filled bars in big cities at night to watch the heart-thumping matches, and many even trekked north to Russia to show their support. U.S.-China trade war: The runner-up comes as no surprise, given the escalating conflict between the world’s two largest economies. A series of events have stoked more fears of the stand-off, including the arrest of Huawei’s financial chief. Typhoon Mangkhut: The massive tropical cyclone swept across the Pacific Ocean in September, leaving the Philippines and South China in shambles. Shenzhen, the Chinese city dubbed the Silicon Valley for hardware, reportedly submitted more than $20.4 million in damage claims after the storm. Apple launch: The American smartphone giant is still getting a lot of attention in China even as local Android competitors like Huawei and Oppo chip away at its market share. Apple is also fighting a legal battle with chipmaker Qualcomm, which wanted the former to stop selling certain smartphone models in China. The story of Yanxi Palace: The historical drama of backstabbing concubines drew record-breaking views for its streamer and producer iQiyi, China’s answer to Netflix that floated in the U.S. in February. The 70-episode show was watched not only in China but also across more than 70 countries around the world. Produce 101: The talent show in which 101 young women race to be the best performer is one of Tencent Video’s biggest hits of the year, but its reach has gone beyond its targeted young audience as it popularized a meme, which made it to No. 9 on this list. Skr: A buzzword courtesy of pop idol Kris Wu, who extensively used it on a whim during iQiyi’s rap competition “Rap of China,” prompting his fans and internet users to bestow it with myriad interpretations. Li Yong passed away: The sudden death of the much-loved television host after he fought a 17-month battle with cancer stirred an outpouring of grief on social media. Koi: A colored variety of carps, the fish is associated with good luck in Chinese culture. Yang Chaoyue, a Produce 101 contestant whom the audience believed to be below average surprisingly rose to fame and has since been compared to a koi. Esports: Professional gaming has emerged from the underground to become a source of national pride recently after a Chinese team championed the League of Legend finals, an event regarded as the Olympics for esports. In addition to the overall ranking, Baidu also listed popular terms by category, with staple areas like domestic affairs alongside those with a local flavor, such as events that inspire national pride or are tear-jerking. This was also the first year that Baidu added a category dedicated to AI-related keywords. The search giant, which itself has pivoted to go all in AI and has invested heavily in autonomous driving, said the technology “has not only become a nationwide buzzword but also a key engine in transforming lives across the globe.” In 2018, Chinese people were keen to learn about these AI terms: robots, chips, internet of things, smart speakers, autonomous driving, face recognition, quantum computing, unmanned vehicles, World Artificial Intelligence Conference and quantum mechanics.